The American belief in reform and progress at the beginning of the twentieth century received a severe blow with the outbreak of war in Europe in 1914. Many had taken it as an article of faith that nations no longer had to resort to war to solve differences, even though Germany had been perceived as a threat to democratic nations by President Woodrow Wilson and others for years. Wilson clung to the principle of American neutrality, but he was obligated to protect American maritime and commercial interests, which, as the war progressed, were being interfered with by both Germany and Great Britain. Germany's decision to begin unrestricted submarine warfare in February 1917, in retaliation for the British naval blockade, forced Wilson's hand. On April 2, 1917, he proclaimed that the "world must be made safe for democracy," and days later Congress passed a declaration of war against Germany. 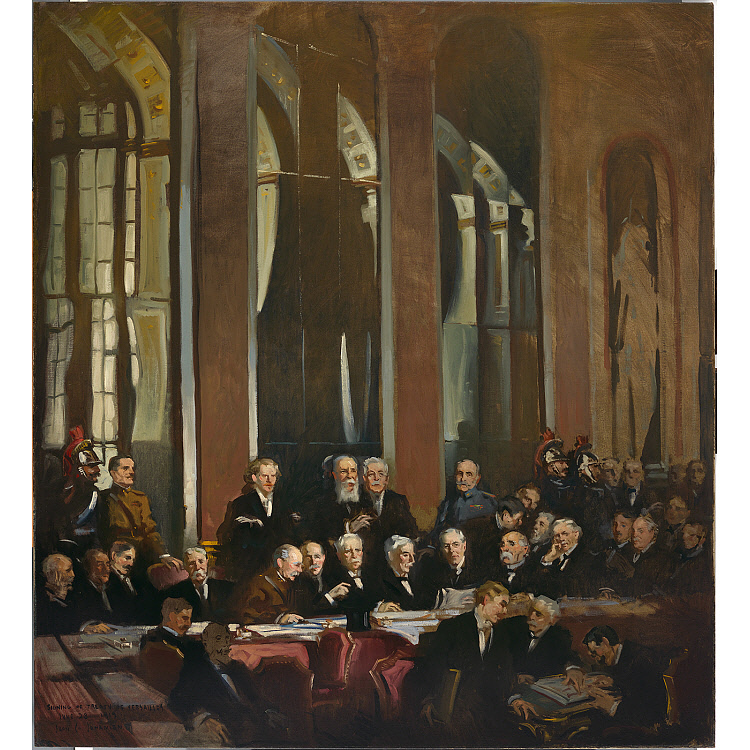 After the war ended, Danish-born artist John C. Johansen portrayed the treaty-signing ceremonies at Versailles in 1919. The disillusion that accompanied the outbreak of World War I, supplanted by the enthusiasm and idealism accompanying America's entry into the war, returned in the final outcome. The United States and the Allies won, but it was not, as Wilson had proclaimed, the "war to end all wars." His hope for a lasting peace, protecting the sovereignty of all nations rather than punishing the vanquished, and his vision of a League of Nations did not survive the realities of international politics. Americans turned away from idealism. Prohibition, ratified in the Eighteenth Amendment in 1919, is viewed by many historians as the last gasp of early-twentieth-century reform. Many Americans then turned their attention to the more mundane matters of making money, consuming mass-produced goods, and immersing themselves in popular culture. The Roaring Twenties had begun. Provenance: Gift of an anonymous donor to NCFA through (Mrs. Elizabeth A. Rogerson, Arden Studios, New York) 1926 ; transferred 1965 to NPG. This collection is created in conjunction with a professional development workshop facilitated by the National Portrait Gallery and Teaching with Primary Sources Northern Virginia (TPSNVA is funded by a grant from the Library of Congress). Have you ever wondered if a portrait is a primary source? In this workshop, we will examine portraits from the Portrait Gallery, along with primary sources from the Library of Congress, to consider this question and explore connections between the two distinct collections. Participants will brainstorm and come up with strategies to incorporate these rich resources into their English and social studies curriculum.